Laurence Polatsch, affectionately known as L.P., was born on October 9, 1968 on Long Island, NY and was raised in Woodbury, NY. After graduating Syosset High School, he studied political science at the University of Michigan, earning his degree in 1990. 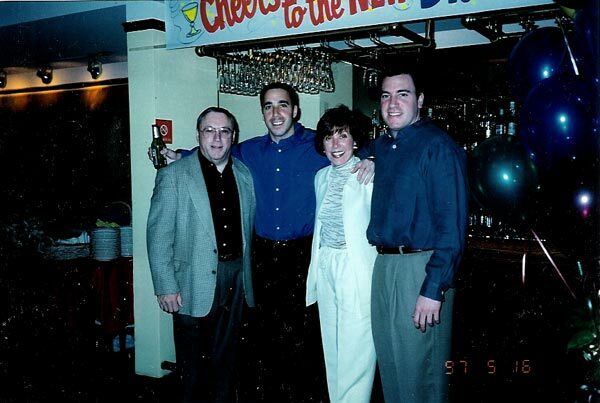 After graduation, Laurence attended Syracuse Law School and began his career in medical malpractice defense in 1993. After a few years, Laurence was tired of “fighting with people” everyday and left the legal profession. During his career transition, Laurence flirted with entering the media and entertainment industry. He loved to be on camera and truly enjoyed the excitement that surrounded celebrities and their lives. He was infamous for many of his antics, including asking Julia Roberts out for a date which ultimately landed him on Entertainment Tonight as the cover story; crashing the Catherine Zeta Jones and Michael Douglas black tie wedding at the plaza; and hopping in the ring with Sugar Ray Leonard after he won a fight in Atlantic City. His love of the limelight earned him one of his many nicknames, “Hollywood.” Laurence’s unique perspective on life allowed him to enjoy each and every day. He joined Cantor Fitzgerald as a sales and trading trainee in 1998. L.P. finally found his calling – his personality, social skills and intelligence would lead to his success. After two short years, Laurence became a Partner at Cantor Fitzgerald in the equities division. L.P. could frequently be found entertaining clients at his favorite restaurants, Angelo & Maxie’s and Daniel and then be the first person in the office the next morning. L.P. was one of a kind. Laurence was tragically lost in the attack on the World Trade Center on September 11, 2001. He is survived by his mother, Linda; father, Bernard (“Buddy”); his brother, Danny; and sister-in-law, Betsy; and countless friends. We love you LP. We will miss you. You were a beacon of light in our lives. You made us smile simply by entering the room. You were generous, kind-hearted and loving, a best friend. We know that you are in a better place now, a warm place, a bright place. We know that you will be happy in that place, you will be safe there. We too will be joining you soon in that place, and the thought of our own death we do not fear, for when our allotted time is up, we will be reunited with you, at last. We know that you will be there, waiting for us, smiling. Please be our guide when we get there, for there is no one we would rather make that journey with than you.